Do you have a favorite color? Usually I cop out and say that all of the colors are my favorite (yes, even brown! ), but if I search deep into the depths of my soul…I’d have to say that I’m quite partial to pistachio. There’s just something happy about that creamy green hue. And the nuts, don’t get me started on pistachio nuts; I’m clearly obsessed with them as documented here, here, here, and here. Somehow, pistachios have just found a way into my life. I’m not too sure if I first became obsessed with the nut or the color, but pistachios are definitely here to stay. My KitchenAid is a lovely shade of pistachio and recently I found some pistachio colored notebooks at the utterly charming everything-you-could-ever-want general store, Tokyu Hands. Do you guys remember the good old high school days when notes were a thing? I’d pretend to be taking notes and listening attentively, but really I would really be writing notes to my bestie. We had codes for the boys we thought were cute: Eeyore was the not so creative moniker for an emo boy I was obsessed with and “The Golden One” was what we named the most popular boy in school. We’d fold up notes in elaborate origami shapes and pass them to each other in the halls between class. It’s funny because we’d spend hours talking on our walks to and from school and on the phone after school, but notes were still definitely a thing. Now kids are more into texting and snapchat, so it warms my heart to see so many people in Japan who still physically write things down with pen and paper. At the beginning of every year, you’ll see a mad rush of people lining up to buy agendas. Yup, they still use little pocket agendas to schedule their days. I haven’t gone that far – I don’t think I could live without Google Calendar, but I do fawn over notebooks. I’m kind of a weird mix between old school and new: I write a blog, so most of my work is done on the computer, but I’m a huge sucker for analogue things. I have a thing for paper and pen, my beloved Smith Corona typewriter (with pistachio accents), handwritten letters, and notebooks of all shapes and sizes. Mike spotted a particularly perfect one for me the other day: it literally said “Pistachio Life Notebook” on the cover. I had to have it, but the aforementioned crazy agenda buying lines were a little too long for me. We left the notebook behind thinking that we’d just head back and pick it up another day, but that turned out to be bad planning on my part because the next time we went back the notebooks were nowhere to be found. And even worse, every time we came back they were still sold out! Finally, after multiple trips and no pistachio notebooks in sight, I spotted a lonely only with a slightly bent corner. I broke out my rusty Japanese to ask a nice clerk passing by if they had any more and after a few minutes in the back, he came out holding a giant bundle. I politely asked for two. He must’ve noticed how I was looking longingly at the pile of pristine, unbent books and somehow knew exactly what I was thinking: he gestured at the bent book I had in my hand and mimed exchanging it with him for a new one. “New?” he asked. “Hai! Arigato gozaimasu!” I totally wanted to break out into a thankful bow, but I think that would have been a little much. What can I say? I’m obsessed with notebooks, especially pistachio ones! Considering my pistachio obsession, it’s pretty funny that I forgot to take photos of these little jars with the pistachios. But, as you can see, they are still a wonderful shade of green thanks to the matcha creme. 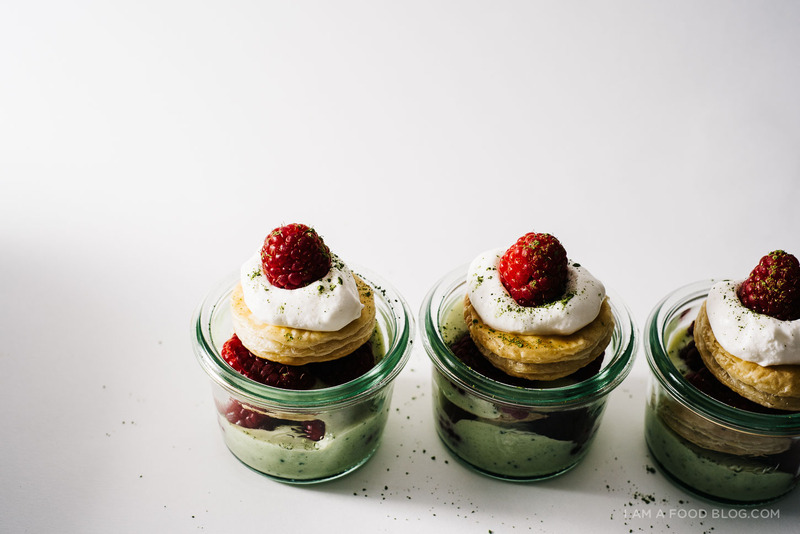 These guys are quick to put together and are utterly tasty: layers of flaky puff pastry, creamy matcha pastry cream, sweet raspberries and, of course, pistachios! Preheat the oven to 425°F. Using a cookie cutter the same size as your jars, cut out as many circles of puff pastry as possible. 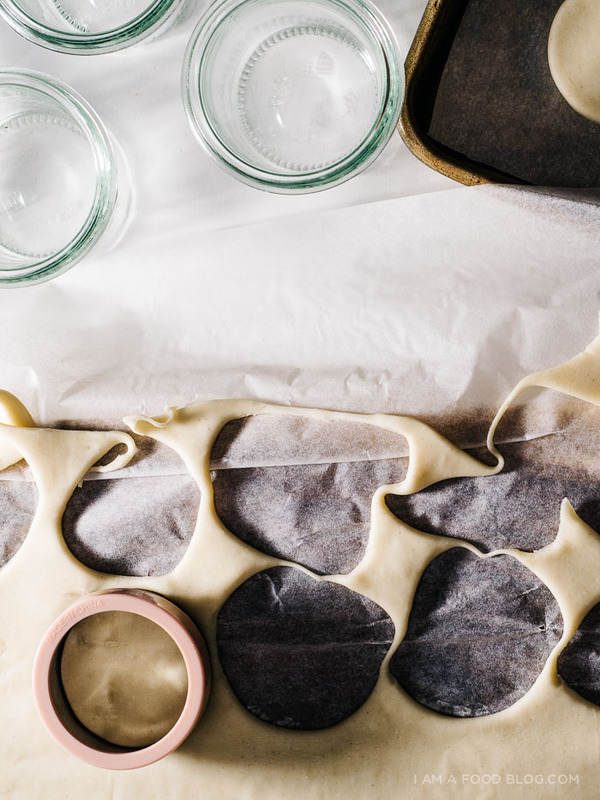 Lay the pastry on a parchment paper lined baking sheet and cover with another sheet of parchment and another baking sheet to weight it down. Bake the puff, weighed down for 25 minutes. Remove the top baking sheet and bake until golden, another five minutes or so. Remove and let cool completely. 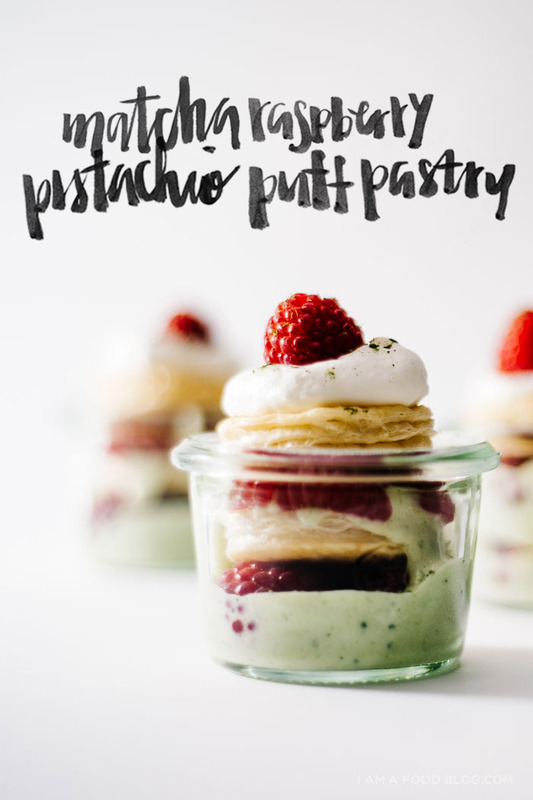 In six jars, place a small amount of pastry cream in the bottom, followed by chopped pistachios, raspberries, and a puff pastry circle. Repeat until all the puff pastry circles are used or the jar is full. 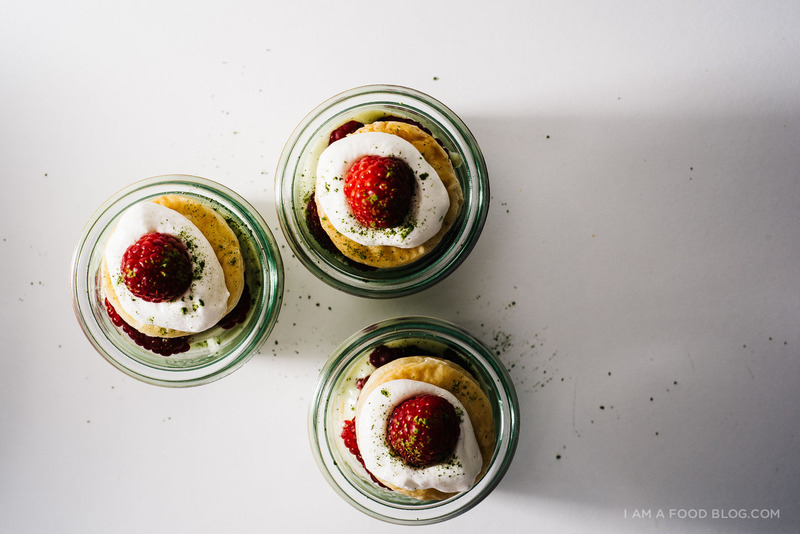 Top with a dollop of whipped cream, a raspberry and a sprinkle of matcha. Enjoy! Prepare a fine mesh strainer over a bowl. Set aside. In a bowl, whisk together the sugar, flour and salt. Add the egg yolk and combine into a thick paste, being sure all the ingredients are throughly combined. Warm the milk over medium heat in a heavy bottomed saucepan until it just starts to steam. Pour a bit of the hot milk into the egg mix in the bowl and whisk to combine. Add the rest of the milk in a slow, steady stream, while whisking. When combined, pour the mixture back into the saucepan. Place the pan over medium heat and whisk constantly until it thickens to a pudding-like consistency. Remove from the heat and sift in the matcha and stir. Pour the cream into your prepared strainer and push through for a smooth cream. Let cool on the counter slightly, until the cream is about room temperature. Gently fold in the whipped cream, cover with a piece of plastic wrap against the surface of the cream and chill completely. Notes: I added in the touch of whipped cream to lighten up the pastry cream a bit but I added it in before the pastry cream was cooled enough. You can skip adding the whipped cream, it’s a question of preference, but if you do, make sure you chill your pastry cream completely. omg. the gif. it’s magical. this is amazing!! I too looove pistachio. Pistachio ice cream especially. And we definitely did the notes thing!! I think I was born basically 2-3 years just before the whole snapchat thing would’ve been a thing at my high school. I remember we had code names for all of the boys in my high school chemistry class one year. It was so fun! These look super cute! On a different note, I also love the brush lettering. And these jars – they’re filled with tons of love! Pistachios are the best — both the nut and the color. My KitchenAid is pistachio colored too!!! Also, your gif is KILLING me. Your perseverance paid off! I had to Google the Pistachio Life Books to see what they look like – love it, especially the graph paper version. I love pistachios btw, love to use them in everything from salads, to desserts, to pesto. 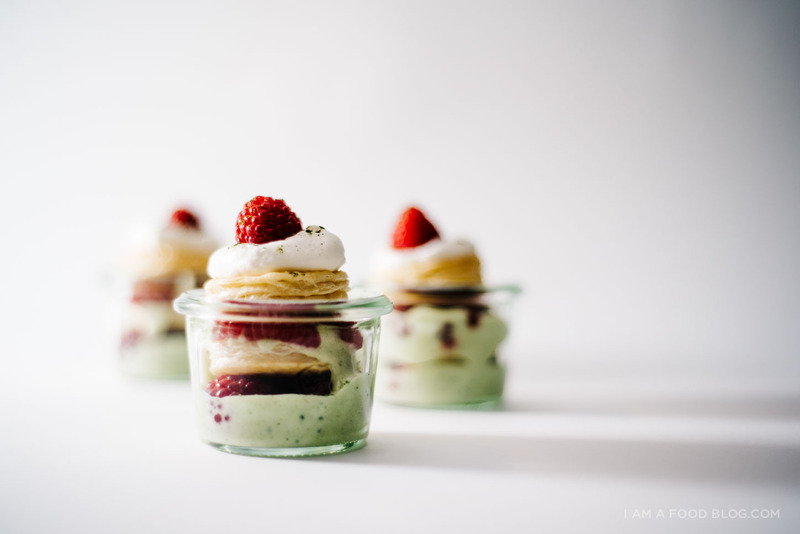 And this Mille Feuille in these adorable little jars looks just perfect. I love pen and paper! I recently started using a planner (agenda?) to organize my days and I am totally having a moment with stationary supplies, especially asian ones…the cuter, the better! These little jars are SO cute. I love the green with the pink raspberries. Perfection! You still have a smith corona typewriter—-amazing. I love pistachios too. And yeah you can’t help but love the color. What a creative recipe that really isn’t that difficult. These look delightful! 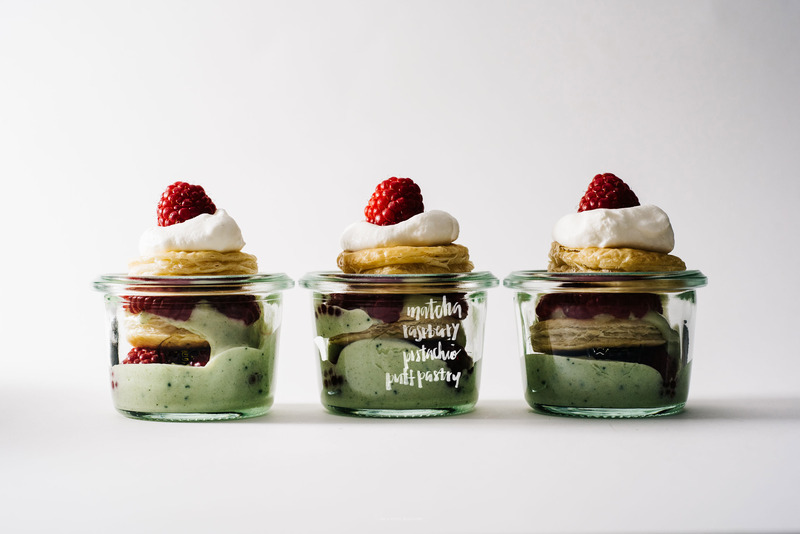 I love the idea of matcha pastry cream. Glad to hear you managed to find the pistachio notebooks again….I adore Tokyu Hands. I love looking at all the amazing pens and I love how they are so lovingly displayed, almost like they are fancy rings or something. Also, I am obsessed with Japanese planners…They come with stickers!!! And fun colors!!! So much more fun than a boring day agenda! Keep enjoying Japan!! yes! if you look at the link next to the recipe title, you can see it on the kitchn, they have it quadrupled! Aren’t these the cutest jars!!! 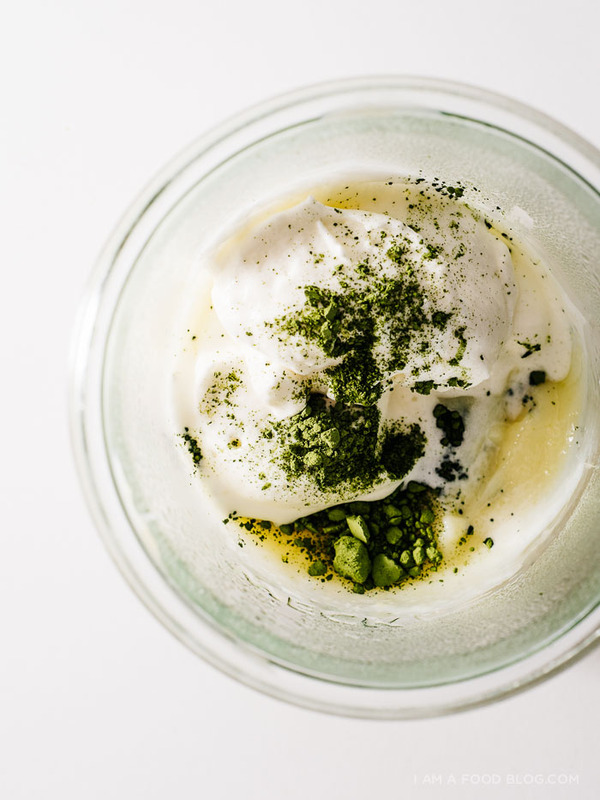 And the matcha custard sounds too good! Awesome job! Steph! Where did you get those beautiful jars? They’re so cute! That .gif, Stephanie! Oh my goodness. Total perfection! And yes… that pistachio color is gorgeous. love! I love the idea of using Matcha in pastry, especially with all the benefits. I’m also caught in between worlds – old and new. I blog but I also live for collecting cookbooks (I can’t bear reading cookbooks on Kindle. I like the feel of paper). Then again, I take hundreds of photos but never once printed them – everything is held in the drive / computer. Ahhhhh…what a wonderful generation we are. Your verrines of Mille feuille looks absolutely flawless! Love ’em! 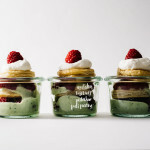 These little jars look delicious and so adorable! I love Stephanie!!! So cute in the bowls! What do you mean by ‘even brown’ Steph? Is brown a color not worthy of liking? The blog looks amazing. pretty sure my favorite color is pistachio too!!! and raspberry. and a soft blue. aaaa i just love all the colors. and these! i looooove these. your gifs get me every time, too! ha! i am a teacher and i teach my student a lesson about blogs and the students looooooooved your blog so much. These are the cutest! I just did a matcha recipe as well! I love the stuff. Thanks for sharing! !